As a passionate gardener or a horticulturist with many years of professional experience under your belt, you surely must have used different types of shovels for tunneling through topsoil, mulch, and graveled earth innumerable times. To a gardener, the shovel is as indispensable as the rake or the pruning shears, and comes handy when he needs to burrow the ground for planting seedlings or for shoveling out dandelions or weeds. If you’ve been gardening for long, you may know from experience that selecting a shovel, appropriate for your specific needs and preferences, from the countless brands available, can be quite tricky. The different kinds of shovels sold online or offline vary from each other with respect to size, design features, durability, ease of use, and performance. While you go through the process of choosing a shovel suitable for your gardening requirements, take into consideration the basic attributes of this tool before you take a decision. 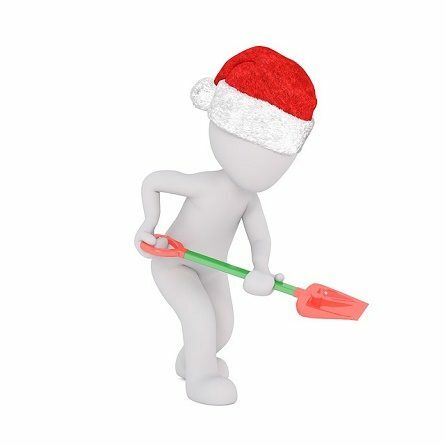 For instance, try to figure out whether you need a shovel with a long or short handle. Additionally, make up your mind on whether a ‘D’-shaped or ‘T’ styled handle-grip will be convenient for you. However, you should always go for a shovel that comes with a curved or rounded blade head as such a specific shape provides you with the leverage for furrowing the tool into the ground. Turn the tedious chores of digging, turning and breaking soil into pleasurable ones with the Fiskars Long Handle Shovel. 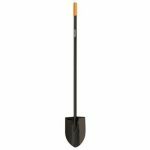 Both the shaft and blade head sections of this shovel, fabricated from 14-gauge toughened steel and welded together, make the tool hardier than fiberglass or wooden models. The blade is extremely sharp with a smooth tapering structure which facilitates in channeling easily through tough clods of earth or hardened up soil. 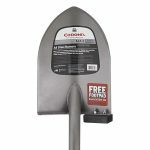 If you’re looking for a performance driven shovel that is also lightweight and durable at the same time then settle for the 14-gauge round point shovel from Bully Tools. 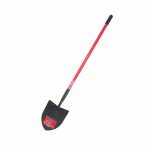 This shovel comes equipped with a blade head forged out of 14-gauge steel with a pointed tip that helps in breaking through the toughest of soil clods and hardened up soil. The blade is seamlessly fused into the fiberglass handle eliminating chances of the same breaking up or getting separated. 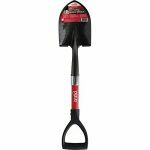 The Bond LH015 Mini D Handle Shovel is one of the most affordable scoops that you can go for that also scores on the performance front. The shovel features a blade head chiseled out of hardy material and heat treated that imparts to it an extended functional life. At the same time, the robust steel handle has been designed in a manner to keep it lightweight and also sports a D-styled, anti-slip grip that aids in shoveling comfortably. 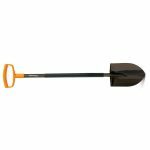 You’ll need to put in a much less effort when you go digging furrows or scooping out earth in your lawn with the 46-inch steel D-handle digging shovel from Fiskars. The tool sports a factory sharpened blade rendering it easy for you to cut through tough lumps of earth or clay. The handle end is D-shaped allowing you to use the force of both your hands simultaneously. If there is anything like the ultimate shovel which can make spading, prying, tunneling, digging, scooping, and trenching child’s play, then it has to be the Corona AS90300. Yes, this shovel does not come cheap (you can buy 5 shovels with the amount you pay for this model) but you easily recoup your outlay over its lifetime. The handle has been carved out of steel that is used in aerospace industry and it has a blade shaped from 12-gauge steel. Shovels are ideally placed for digging, prying out deep-seated weeds, loosening the earth, breaking up hard lumps of earth, and so on. Almost all the models taken up in this review-two from Fiskars, and one each from Bully Tools, Bond, and Corona made the grade in terms of performance, durability, and ease of use. The Corona AS90300 was adjudged the best as it sported a handle crafted out of aerospace steel and was guaranteed to last for ages. Understandably, the Corona model was much more expensive than other brands of shovels. The shovel from bond was the most affordable but did the basic job effectively.